A ROAD passing by Wiltshire’s most well known landmark will close, it has been confirmed. Wiltshire Council has accepted the recommendations of planning inspector Alan Boyland to close a section of the A344 to improve the setting of Stonehenge. The recommendations were made following two public inquiries held earlier this year into English Heritage proposals to return the area to grass as part of plans for a new visitor centre at Airman’s Corner. The decision comes despite objections from objectors including Orcheston Parish Council and residents who fear extra traffic through the village as a result. A proposal was also made to close the byways around the ancient monument but this was refused. Mr Boyland said: “I accept that Wiltshire has a considerably greater length of byways than any other country. This is not however, in itself, a reason for allowing a further loss for recreational motor vehicle users. 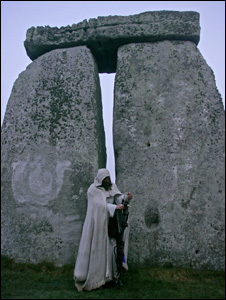 Druid leader King Arthur Pendragon objected to the proposals to close the byways as he said it would be a violation of his human rights not to be able to access the area, particularly during Pagan ceremonies such as celebrations of the solstices and equinox. However, Mr Pendragon approved of proposals to close part of the A344 to improve the amenity of the area. 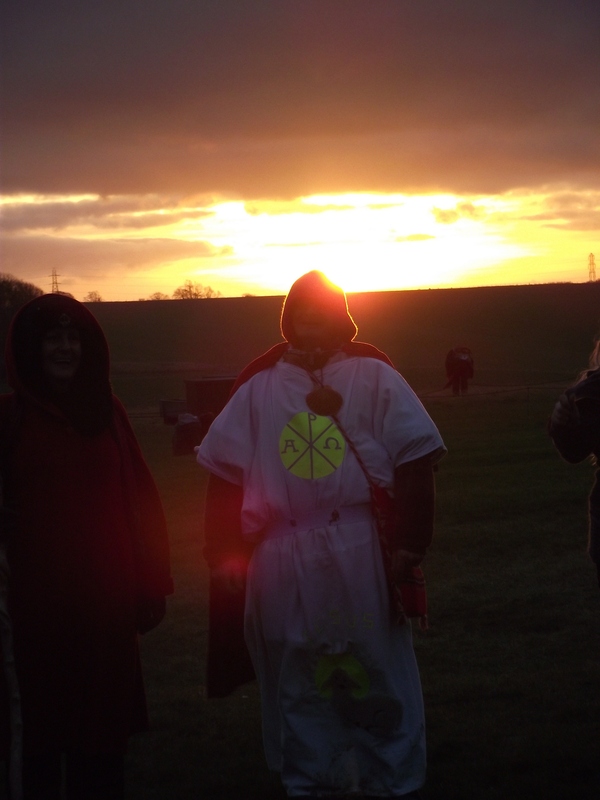 The omens are good that 2012 will be an excellent year, a druid said today, after the sun shone on Stonehenge during a dawn ceremony to mark the winter solstice. Organisers of next year’s London Olympics could perhaps take heart from the positive pronouncement by Rollo Maughfling, the arch druid of the standing stones in Wiltshire, after this morning’s ceremony. He said that the sun rising over the horizon at the end of the religious service, bathing more than 1,000 people who attended in pale light, meant good things for the next 12 months. 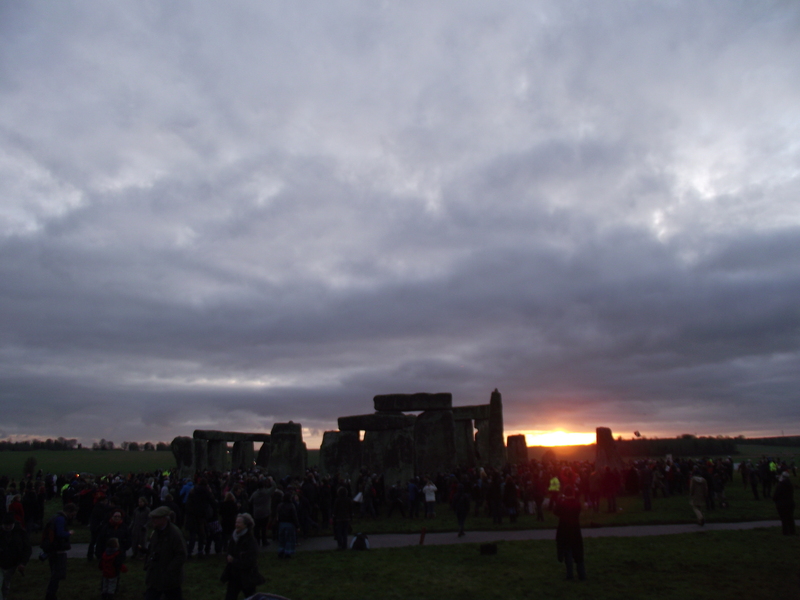 The mild temperatures and sunshine at the pre-historic site were a marked contrast to last year’s solstice, when the giant stones were surrounded by a thick blanket of snow and the winter morning mist obscured the actual sunrise. ”Just as the ceremony came to an end the sun came over the horizon, it was excellent,” Mr Maughfling said. During the winter solstice, the sun is closer to the horizon than at any other time in the year, meaning shorter days and longer nights. The shortest day of the year often falls on December 21, but this year the druid and pagan community marked the first day of winter today because the modern calendar of 365 days a year – with an extra day every four years – does not correspond exactly to the solar year of 365.2422 days. Scientists locate exact source of Stonehenge stone but how did they get there? Scientists have located the exact source of the rock believed to have been used to create some of Stonehenge’s first stone circle. Researchers have been able to match fragments of stone from around the 5,000 year old monument with an outcrop of rock in south-west Wales. The work – carried out by geologists Robert Ixer of the University of Leicester and Richard Bevins of the National Museum of Wales – has identified the source as a site called Craig Rhos-y-Felin, near Pont Saeson in north Pembrokeshire. It is the first time that an exact source has been found for any of the stones thought to have been used to build Stonehenge. The discovery has re-invigorated a long running debate as to whether the smaller standing stones of Stonehenge were quarried and brought from Pembrokeshire by prehistoric humans or whether they were carried all or part of the way to Wiltshire by glaciers hundreds of thousands of years earlier. Archaeologists tend to subscribe to the ‘human transport’ theory, while geomorphologists often favour the glacial one. The debate is solely about Stonehenge’s smaller standing stones which are sometimes known collectively as bluestones. The larger stones, or sarsens, are accepted to have been incorporated into the monument several centuries later. The remarkable find has been reported in the journal Archaeology in Wales and opens up the possibility of finding archaeological evidence of quarrying activity at Craig Rhos-y-Felin which would indicate humans rather than glaciers were responsible for transporting the stone. Research over recent years by Tim Darvill of Bournemouth University and Geoffrey Wainwright, a former chief archaeologist at English Heritage, suggests that the Pembrokeshire stones may have had a particular ideological significance. The outcrops where some of the stones come from are thought to have been associated with sacred springs and local Welsh stone circles. By bringing those particular rocks the 160 miles from Pembrokeshire to Wiltshire, the builders of Stonehenge may have thought they were obtaining more than just plain rock. Experts have suggested they may have regarded the stone as having supernatural powers. For us in the northern hemisphere, the December solstice marks the longest night and shortest day of 2011 and falls on Thursday, 22nd December. After the winter solstice, the days will get longer. Celebration time! December 2011 solstice will occur on Wednesday, 21st December at 11:30 p.m or 05:30am Coordinated Universal Time (UTC) on December 22, 2011. It is also known as the winter solstice in the northern hemisphere and the summer solstice in the southern hemisphere due to the seasonal differences. The date varies from December 20 to December 23 depending on the year in the Gregorian calendar. The 2012 December solstice will be on December 21, 2012, which is a speculated date for “the end of the world”. Use the Seasons Calculator to find December solstice date in other time zones or other years. At Stonehenge on this day, people watch as the sun sets in the midst of three great stones – known as the Trilithon – consisting of two large vertical stones supporting a third, horizontal stone across the top. 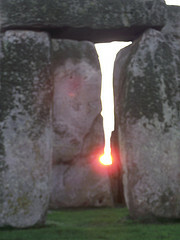 This Stonehenge monument – built in 3,000 to 2,000 BC – shows how carefully our ancestors watched the sun. Astronomical observations such as these surely controlled human activities such as the mating of animals, the sowing of crops and the metering of winter reserves between harvests. 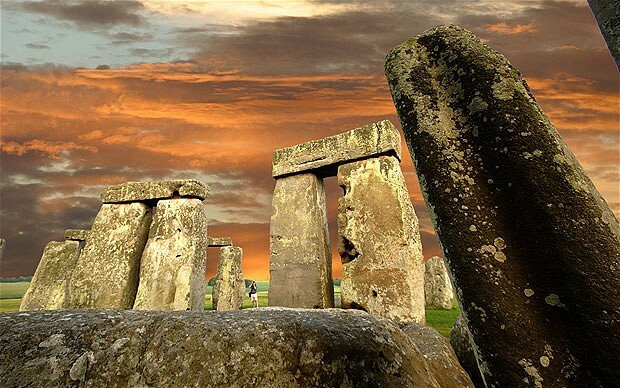 Stonehenge is perhaps the most famous of of the ancient astronomical monuments found around the world. 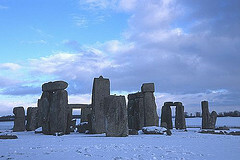 Will it snow at Stonehenge this year ? The December solstice occurs when the sun reaches its most southerly declination of -23.5 degrees. In other words, it is when the North Pole is tilted 23.5 degrees away from the sun. Depending on the Gregorian calendar, the December solstice occurs annually on a day between December 20 and December 23. On this date, all places above a latitude of 66.5 degrees north are now in darkness, while locations below a latitude of 66.5 degrees south receive 24 hours of daylight. The sun is directly overhead on the Tropic of Capricorn in the southern hemisphere during the December solstice. It also marks the longest day of the year in terms of daylight hours for those living south of the Tropic of Capricorn. Those living or travelling south from the Antarctic Circle towards the South Pole will see the midnight sun during this time of the year. On the contrary, for an observer in the northern hemisphere, the December solstice marks the day of the year with the least hours of daylight for those living north of the Tropic of Cancer. Those living or traveling north of the Arctic Circle towards the North Pole will not be able to see the sun during this time of the year. The Solstice is however, the complete antithesis of what has now become Christmas in contemporary society. Also known as ‘Yule’, the Solstice is generally celebrated on the 21st of December, (although the astronomical date changes from year to year – this year the actual Solstice takes place on the 22nd, at 00.22a.m). The Winter Solstice is the shortest day, and longest night of the year, and is the traditional time to celebrate the truly important things in life: your family, your children, your home and looking forward to a wonderful year to come. Yule is a time throughout time that honours love and new birth, as well as the collective unity of man. Just as Christmas celebrates the birth of Christ, Yule celebrates the birth of the Sun God – child of the Goddess in the Pagan belief system. Yule is primarily the celebration of the rebirth of the Sun. Many people associate the Winter Solstice, or winter itself with death, as it is the season in which nature is dormant, and in which many plants die off and crops are scarce. Conversely, the Winter Solstice, although it is the longest night, (boasting more than 12 hours of darkness), it is also the turning point of the year, as following this night the sun grows stronger in the sky, and the days become gradually longer once more. Thus the Winter Solstice is also a celebration of rebirth, and there are many traditions that stem from this perspective. As the longer days draw near. In the winter’s darkest hour. for His hungry children’s good. The tradition of bringing sprigs of Holly and Ivy into the home pays homage to the masculine and feminine elements. Both of these powerfully magickal plants are evergreen, a reminder in itself that the earth never dies, but merely sleeps during the winter months, (a tradition which was the precursor to our modern tradition of the evergreen Christmas tree). The male element is represented by the prickly holly; with its sexually potent red berries. The mistletoe is the female; entwining, gentle yet powerful. An alternative view of Holly is that the leaves of the plant represent the male, whereas the red berries symbolise the resting Mother Goddess, and life returning to the land. The symbolism of Holly is especially potent. The Holly King and the Oak King are part of Celtic/Pagan mythology, and they represent two sides to the Greenman, or Horned God. Since the Summer Solstice, the Holly King has ruled the half-year of waning light, yet on this night the Oak King will take his throne to rule. In other words, the Oak King rules over the lighter half of the year, (Yule to Litha), and the Holly King over the darker half (Litha to Yule). Another account of the Holly King and Oak King imagery is that they do not directly switch places twice a year, but rather both exist concurrently. The Oak King is born of the Goddess at Yule, growing in power through the spring, peaking at Beltane and then weakening through autumn until he dies at Samhain. The Holly King however lives a reverse existence, and is born at Midsummer (Litha), increasing in strength throughout summer and autumn, reaching his zenith at Samhain. His sway then diminishes until it is his turn to pass at Beltane. Thus the two Kings enjoy a more elaborate sense of duality in this account, and it is perhaps a better illustration of their twofold nature, and their varying levels of influence throughout the year. As such they both have their characteristics. The reign of the Oak King is a time for growth, development, healing, and new beginnings. The Holly King’s time is for rest, reflection, and learning. Thus the Holly King is honoured with the boughs of Holly, and the Oak King is honoured with Mistletoe – the belief being that Mistletoe is best grown on the Oak as Mistletoe’s most powerful host, (a belief strengthened by the opinion of the 17th century herbalist, Culpepper). Ivy is representative of the Goddess; mother of both Kings, both Kings also being her consort – again powerful ideas of duality. Mistletoe has a most compelling and influential history. According to ancient Druid tradition, Mistletoe was the most sacred of all plants. Mistletoe was used by the Druid priesthood in a very special ceremony; held five days after the New Moon following winter solstice. The Druid priests would cut Mistletoe from a holy Oak tree with a golden sickle. The branches had to be caught before they touched the ground. The priest then divided the branches into sprigs and dispersed them to the people, who hung them over doorways as protection. The folklore, and the magickal powers of this plant, have blossomed over time, although most are now forgotten. It was believed it had miraculous properties that could cure illnesses, antidote poisons, ensure fertility and protect against witchcraft. It was also a sign of peace and goodwill. When warring tribes came across Mistletoe, a temporary truce would be observed until the next day. However, although Mistletoe carries a broad array of customs, and benefits in ancient times, the tradition which has lived on is that concerning fertility and love. According to most current day traditions, a young woman stands under the mistletoe and awaits her lover’s kiss. But from where did this tradition spring? It is considered that Mistletoe and kissing tradition is borne of a Norse myth. The Norse god Balder was son of Frigga, goddess of love and beauty. She loved her son to such a degree that she had the four elements: Fire, Water, Air, and Earth- promise that they would not harm her son. However, Loki, an evil spirit, found the one thing that could defy this promise – mistletoe. He made an arrow from its wood, which was shot at Balder’s heart, and he fell dead, and Frigga’s tears became the mistletoe’s white berries. Balder is however, restored to life, and Frigga is so grateful that she reverses the reputation of the offending plant–making it a symbol of love and promising to bestow a kiss upon anyone who passes under it. In the true spirit of Yule, focus your celebrations as a family upon love, and the fact that every ending is a new beginning. There are many simple rituals that you can enjoy as a family, to seal your bonds and celebrate each other at this magickal time of year. There are a number of tours departing from London that include Stonehenge on Christmas Day, the New Year and over the festive period. Please use the link below to view the available coach tours. 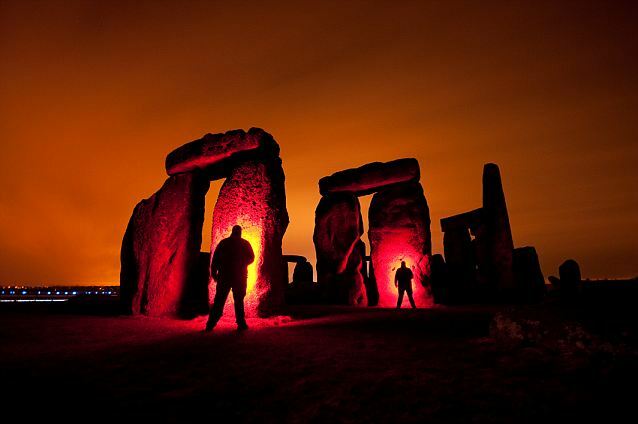 It’s a stunning illuminating technique which when used at Stonehenge turned the ancient British wonder into an amazing after-dark spectacular .. welcome to the world of light-painting. Light-painter Marc Bowyer-Briggs has fused his photographic creativity and technological skills to turn the Wiltshire standing stones into a technicolour lightshow. 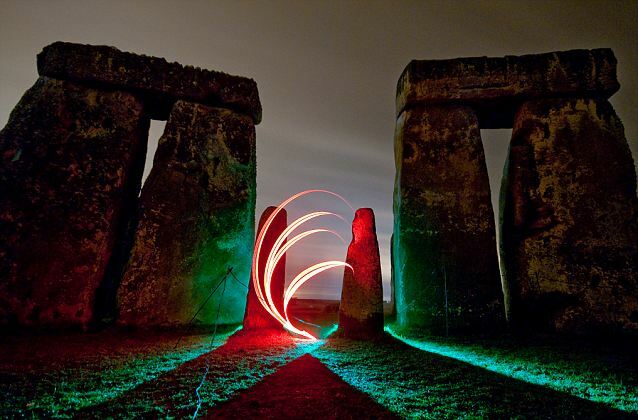 Using a technique involving electroluminescent wire and a long exposure on his camera, the 33-year-old from Portsmouth brought the dark stone monoliths to life with dazzling multi-coloured effects. The dark nature of his art means that Marc is constantly roaming Britain’s countryside and cities by night – a task that comes with its own challenges. ‘It can get very exciting when you’re shooting in an inner city at night, especially when a group of drunk people are coming your way,’ he said. ‘In the past I’ve watching security guards at Stonehenge spot people trying to mount the fence. Marc, who has been honing his talent for light painting over four years, explained how he is able to create such fantastic images. He said: ‘There are many methods to the madness but ultimately, you just need a camera that’ll take a long exposure. ‘You can keep the shutter of your camera open for as long as you wish. ‘Coupled with a cable release and a tripod, some light tools and some imagination, anyone can do it – the limit is purely your imagination. Marc’s previous works include green laser tunnels and light painted UFOs gliding over the shadowy English countryside. He has received popular enthusiasm for his work – so much so that he has now started to share his expertise with others. He said: ‘Once people understand how the picture is created, more often than not, they’re in awe and want to go out and try it for themselves. ‘I’ve recently run an evening training course that I’m looking to increase the frequency of with a couple of friends. ‘The first half starts with the theory behind night photography, and how to do it, and the second half is a practical hands on. ‘The reaction we had from the first evening was fantastic.